I have to say that in this season of the world, this book cover seems very offensive. I understand that it is about wisdom, and respect in knowing when to speak, but with so many stories that come out all the time (as well as my own person experience) of being hushed up and disrespected because we are women, putting a picture of a woman's mouth being mechanically sealed seems like a very dodgy image to put out to the world. (I do not intend to slight the content of this book at all, so I am leaving positive star ratings). 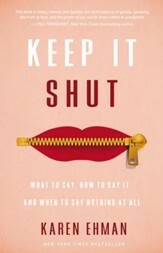 I've bought this book as I have found myself in situations when I should have kept my mouth shut. The author gives good advice. I never would have imagined there could be so much to learn/discover/review about the power of our words --- good AND bad! A different perspective on an age-old issue! i have read many books on this topic but this is the first book i have read that gives you lots of tools to avoid social media pitfalls as well as real life situations to help you navigate our complex world using biblical principles and humerous real life situations. Great book for married and singles. Great book for everyone as well as for a book study. it was a a great find and very thought provoking with lots of take away ideas and tools. Completly loved it and hope she writes a book using the same principles for teens or kids. I plan to share the highlights from each chapter with my 9 year old daughter each week as we explore this topic.